Numbers from ForeSee research again favor non-profit financial cooperatives; apps considered superior to mobile websites. 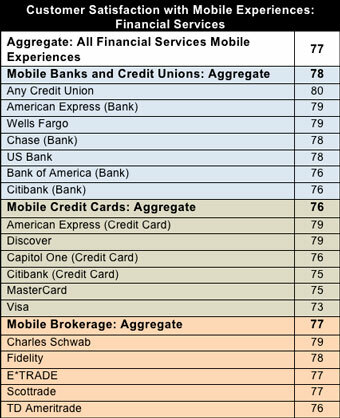 This chart from ForeSee shows how “any credit union” ranks against the big banks in mobile satisfaction. Credit unions have received the best score in customer satisfaction for mobile banking, beating out big banks, credit cards and brokerage firms, according to ForeSee, an Ann Arbor, Mich.-based consumer research firm.